…Or, how to find a job when no one’s hiring. After my post about the jobs report on Friday, a friend suggested that before continuing with Job Search January, I should at least address what it’s like to try to find a job in a tight job market. I began my career in the late 1990s, and initially as many as 1/3 of my clients were in IT and related tech fields. So I wasn’t in this business very long before the Dot Com Bubble burst, and I spent a good 3 years or so helping IT people especially, try to find jobs in what was then an employment wasteland. The earlier the better. When any market turns south, it becomes a self-fulfilling prophecy. When the job market goes bad, it’s no different: people look around and see their competitors have stopped hiring, and suddenly they feel like they should cut back too. And then when they cut back, others notice and cut back as well. You’re dealing with a herd mentality. If you get out ahead of that wave of perception, you can hopefully sneak in under the wire. Additionally, if you get yourself out there first, you’re competing with less people. If you wait until layoffs are all over the place and the unemployment numbers are skyrocketing, then it’s too late: you’re in the same boat as everyone else. If your particular industry is starting to go south, start packing your parachute now. Networking is even more important in a tight job market. I’ve already suggested that networking is the quickest way to a new job. But when no one is hiring, this is even more true. Think about it, in that sort of a situation, the only way you have a chance at getting your foot in the door at your dream company is to know someone who already works there and can agitate on your behalf from the inside. Line up your contacts and keep in touch. If you’re currently still employed, make a comprehensive contact list while you still have access to that information. Remember, you want to enlist the aide of anyone you know when you’re in the midst of a job search. But the best prospects by far, are people in your industry. Know who they are and make sure they don’t forget you. Sell yourself as a cost-saver or turnaround artist. All your vaunted skills and accomplishments might not mean anything in a tight job market. People would love to hire you, but right now they can’t use you. However, if the times are tough, what they CAN use is someone who can manage the tough times effectively. If you can add value to a company, every company is hiring. In a bad economy, what is valued above all is an ability to deliver solutions that can help a company survive and turn the bad times around. In a tight job market, a lot of people just accept it. ‘Look, no one is hiring. What can I do?’ Bologna. Don’t fall into a defeatist attitude. That doesn’t do you any good at all. Keep your eyes open and think outside of the box. Look for hidden opportunities. As hard as this is to do sometimes, you need to have a zen attitude about rejection. It’s not always about you. Sometimes it’s just a matter of time and luck. What if I had a crystal ball and told you that you would land your job only after your 14th interview. Well, you’d never even get there if you gave up after only 12. Try, and then try again. And again. And again. Remember, even in a recession, some people are still doing well. Somewhere. It might be in a tiny, hard to find niche. All that means is you have to be resourceful to find the hidden gems. In the very teeth of the last IT recession, Google started hiring like crazy. If you had gotten on board then, you’d be a multimillionaire now. Ok, you say, but I’m not a programming genius. Fine. Neither am I. But I remember helping several people get hired at Netflix years ago, right when they were taking off. The rest of the economy was in the tank, but little old Netflix was just beginning it’s growth and they couldn’t hire accounting, retailing and logistics people fast enough. Get past the stigma and the shame. A lot of times clients come to me depressed that they even have to ask for a job. Look, everyone loses a job sometime. It’s nothing to be ashamed of. And in fact, a timid or embarrassed attitude is counterproductive. You need to be projecting a positive attitude. You’ve got plenty to offer! They’re going to be lucky to hire you! Even if you’ve suffered through rejection after rejection, don’t forget the unique skills and experience you have. You’re like a great stock in a bear market. Just cause no one’s buying doesn’t mean your underlying value has gone away. One day your Warren Buffett will come and notice how undervalued you are. All bad markets are temporary. Having a job in tough times is very much a bird in hand situation. Take what you can get, even if it’s a step down. It’s better to have a so-so job now so the paychecks keep coming in and you’re still gaining experience. This is much preferable to holding out for your dream job for months or even years. The opportunities will be there again soon, and when they are, you can land the dream job then. Yep, just as he said things. This is excellent advice. There is in fact a recession coming in 2008 and FAST. If you look at the stacking facts even an elementary student can see it SO BE PREPARED. The Dow is dropping like a madman, the big companies are shrinking like salt on a snail, Ebay is even at its lowest point EVER. Google, Sears, Wal-Mart, Citi…..take a look and see for yourself. Check the past 6 month report. Face it, crap rolls downhill and we are at the bottom. People in CA are living in TENT CITIES because of the housing foreclosures, Gas is EASILY 3.00 a gallon (in the winter), basic needs are far expensive than they were just a mere 3 years ago. I see this and I am just a high school drop out, not a college grad that can see more factors. Where there is smoke…theres fire. People with security are falling hard right now, the majority of the common man better wisen up. I live on the bottom so Im used to it by now but through informing and helping each other we can make it. And as a last note, Get off your buns and VOTE this year! Do you really want another GWB? If you dont vote, then go live somewhere with a dictator. America was built by the people, for the people to live free. This aint living. Excellent advice. 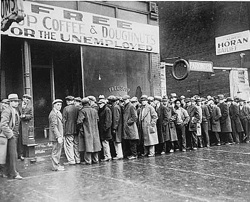 There are more tips here at Finding a job during a recession. You may be a high school drop out, but your wisdom hit this one right, smack in the face. America is in a recession. Be encouraged in knowing that God is still opening up doors of opportunity. Have you ever read the bible? Do you believe in what it says? Well, if you are interested in learning how this old world is going to turn out, read 2Timothy 3:1-5 , Mathew 24:3-14 and Luke 21:25. In these difficult times, there is much practical usage that we can get from Jesus Christs’ sermon on the mount found at Mathew the 6th chapter. Christ advises that if we do not want to have a lot of anxiety, which steals our life away, we need to be content with the necessities. However, above everything else we are advised at the 33rd verse of that 6th chapter of Mathew, to seek God’s kingdom and his righteousness. This thought is expansive-so try wrapping your mind around something that you cannot see and that you do not have faith in. Remember, faith is not automatic nor is the love of God because these qualities must be cultivated. Anyway, as to the recession, every system that makes up this world-the political, commercial, religious, institutional higher learning and so forth and so on will be eventually destroyed by the Kingdom Of God, in which many misinformed religious persons oddly pray for to come. Right now, the very foundation of this system is being shaken to the ground. All of this information is found in Gods’ word the bible. If anyone is interested in asking any questions, please feel free to do so. thanks Johnathan, your works are very encourgaging and could not have come at a better time, thank you for your post. God bless you. One of the great points here is selling yourself as a cost-saver or turn-around artist. This is about doing something few are mindful of- pretending to be the boss interviewing them and understanding what she/he wants before speaking. Having said that, since we’re also talking about being more creative during this economic slump, why not think outside the box of looking to work for another in the first place? Been proudly unemployed for over a year! You make some great points about job hunting in a recession. Your advice is usable unlike a lot of advice I’ve seen which is good in theory but not practical. yes that’s true … like me. This is really nice article to read. It will really help me to increase my amount of knowledge about how to get jobs. Thanks for sharing such a good article with us. about to file for Chapter 11. In fact, many are weathering the storm just fine.